AKB48's Maeda Atsuko wears a cute sailor uniform for "Moshi Dora"
On February 17th, the live action version of�Tanaka Makoto's best-selling short novel, "Moshi Koukou Yakyuu no Onna Manager ga Drucker", finished shooting. Although temperatures were below freezing, AKB48 member Maeda Atsuko was still wearing her short-sleeved uniform for the shoot. "I was surprised that the movie was set in midsummer since it's midwinter (right now), but since the other cast members and the extras all did their best to act in short sleeves, I acted as if it was summer," stated Maeda, who plays the main character, Kawashima Minami. 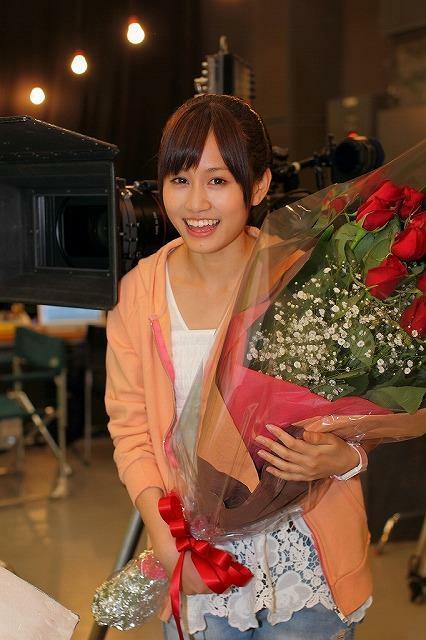 When she finished filming for "Moshi Dora," the director presented Maeda with a bouquet of flowers. "There was so much pressure since it was my first leading role, but when it was all over, it all become a fun memory. My co-stars gave me so much support... I'm truly moved by the Hodokubo baseball team. Since it looked so much like summer even though it was snowing when we filmed, please look forward to it! ", Maeda exclaimed with a bright smile on her face, relieved that she could finally put on warmer clothes. Kawashima Minami, who works as the manager for a high school baseball team, accidentally purchases the book "Management" by the Australian writer Peter Drucker, but then consults it as she reforms the team and tries her hardest to make their dream of going to the Japan National High School Baseball Tournament come true. The book had sold an impressive 1,810,000 copies by December of 2009, establishing the short novel as a "home run." Other cast members include Seto Kouji, AKB48 member Minegishi Minami, Ikematsu Sousuke, Kawaguchi Haruna, and Ooizumi You. AKB48 mastermind Akimoto Yasushi also produced the movie. "Moshi Dora" will be available in theaters across Japan beginning in June, but no official date has been set. AKB48 performs "Sakura no Ki ni Narou" on Happy Music!